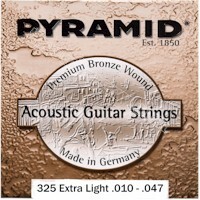 Pyramid's premium acoustic phosphor bronze round wound strings are noted for their bright, open sound, in addition to a very long life. These are hand wound acoustic bronze sets of the highest quality. They also come in 12-String sets which are available upon request at TheStringGuy.Com.